“Bonjour,” “Jambo,” “Xin Chào,” “Shalom,” “Olá,” “Konnichiwa,” “Hello” . 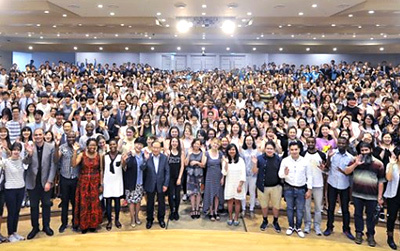 . .
On July 23, 2017, a seminar for foreign students was held at the New Jerusalem Pangyo Temple under the theme of “Our Mother.” It was an event to deliver the encouraging message with Mother’s love to foreign students who are studying in Korea and to help them make tomorrow better as they are responsible for the future of each country. 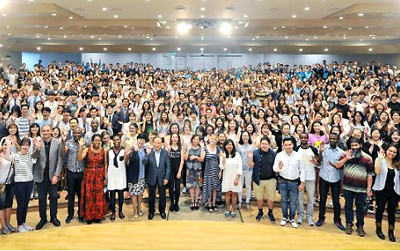 Despite heavy rain, over 200 foreign students from 43 countries such as Ghana, Romania, Mongolia, U.S., Vietnam, Brazil, Ethiopia, U.K., Ukraine, Egypt, Italy, India, Zimbabwe, Colombia, and France and more than 400 Korean university students gathered to make unforgettable memories and build a special friendship beyond language and nationality. Many people from all walks of life, including Mr. Panko Panov, Deputy Head of Mission of Bulgaria, attended and encouraged those who would lead the future of the global village. 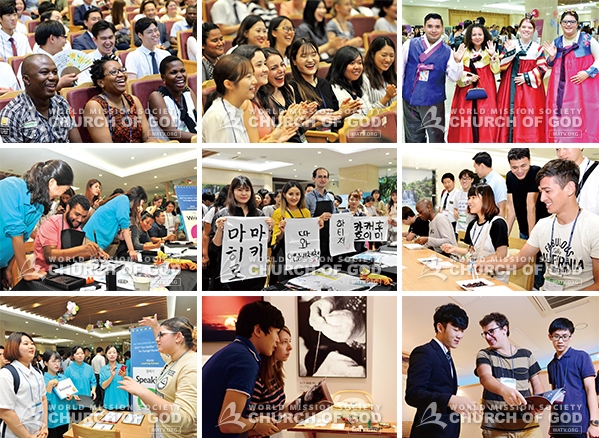 Before and after the seminar, a variety of events boosted foreign students’ excitement. “Our Mother” Writing and Photo Exhibition held on the fifth floor of the Pangyo Temple was crowded with the students who all looked different and spoke different languages, until evening. Like Korea, Tanzania was once colonized and got independent in 1961. 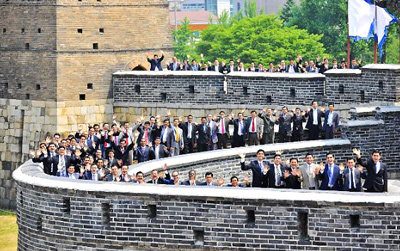 Korea has been restored and developed remarkably after the war. I wanted to learn the secret. I was attracted to the similar history of the two nations. Today I felt the need of a mother’s heart for the development of Tanzania. The seminar was well organized enough to let me understand the importance and value of the love of mothers, although I’m from a country of different culture and ways of thinking. Mothers try to feed their children, no matter how many they are, even if they cannot eat. They can sacrifice themselves because they have love for their children. The government officers and politicians should play the role of mothers, but if they do not have love, sacrifice, and devotion, they may fail to do it. When I go back to Tanzania, I want to work with the heart of a mother. I came from Daegu, and it rained heavily. But the seminar was definitely worth coming. These days, there are people whose relationships with their mothers are not good. Some even regard their mothers as bothersome. Mothers, too, feel more distant from their children, as they spend less time with them. It will be great if they can have some opportunities to feel their mothers’ love more and to strengthen their family relationship. I believe “Our Mother” Writing & Photo Exhibition that I saw today would provide a great chance for them. I think people would call their moms after the seminar. I wanted to call my mom and talk to her, all throughout the seminar. In the global village, people are all different. If they cannot understand each other, problems will only grow. If everybody can have the heart of a mother who embraces her child with love, the world will become a better place. I’m studying international medical policies. That’s why many patients consult me. I’ll be able to help them more with the mindset of a mother treating her children. I could comfort my yearning for my mother whom I haven’t seen for a year and learn what kind of mindset I’d better have in treating my patients. Today’s event was full of love. People were all smiling. It was great. I’ve never seen such bright smiles anywhere else. It feels familiar because Koreans are affectionate just like Turks. I’m studying Korean now. When I get fluent in Korean, I’d like to study law. I want to become a social worker and help people. 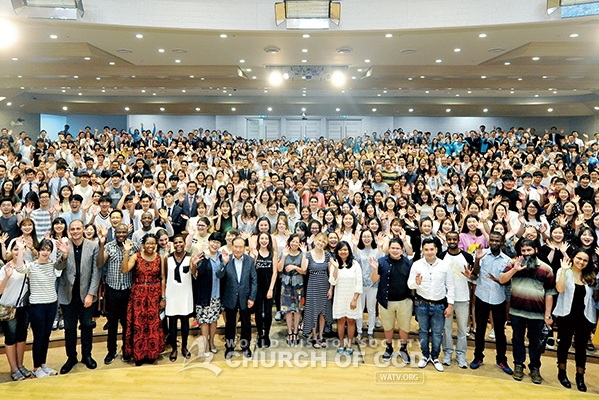 The Church of God university students help many people and carry out different types of volunteer services. I too want to do voluntary work, like interpreting for the participants in an event like this.